THANKS TO THE 2012 BIENNALE OF SYDNEY AND CARRIAGEWORKS SYDNEY AUDIENCES WERE BLESSED WITH PERFORMANCES OF TWO MAJOR, INTERCONNECTED WORKS BY ONE OF THE GREAT CONTEMPORARY CHOREOGRAPHERS, ANNE TERESA DE KEERSMAEKER, IN COLLABORATION WITH THE DANCERS OF HER BELGIAN COMPANY ROSAS AND MUSICIANS. EN ATENDANT, PERFORMED FIRST IN SYDNEY, EVOKES THE TRANSITION FROM TWILIGHT TO NIGHT, WHILE CESENA EMERGES FROM NEAR DARKNESS TO SUNRISE. Across the forestage is a thin line of what appears to be soil. To the right is a simple bench. A flautist (Michael Schmid) crosses the line, stands before us, head down, silent. He sighs deeply. He breathes into his instrument, gradually forming slowly rising notes of increasing purity against a low chord which pulses with raw escalating intensity. Even though the apparent breathlessness of the performance is enabled by cyclic breathing, we sense the demands of duration and the multi-planed playing. Relief comes suddenly when Schmid stops playing and bends deeply forward. We catch our breath as one. István Matuz’s composition for flute, L(ÉLEK)ZEM, has taken us into a new space, oddly at once contemplative and anxiety-inducing. But even that is subject to transformation as the flautist leaves and a soprano arrives, sits on the bench and, to deep, breathy recorder accompaniment, sings En Atendant Souffrir (While waiting I must suffer) by the 14th century composer of the Ars subtilior style, Filippo de Caserta. The composition’s plangency, the sombre voice of the recorder and the crystalline clarity of the singing evoke the Middle Ages, as if we have been suspended between our own time (the contemporary work for flute) and the past, but connected by breath. Dancers appear in small numbers, alone or in groups, half bending at the knee, sliding, slipping, leaning, moving unpredictably. They form a line but are unable to cross the stage as one, breaking into their own walks or dance fragments. One man travels the breadth of the stage with a semi-urgent walk, followed by another whose pacing is not quite the same. They reverse direction. Others lead and follow. The rhythm, sometimes quite complex, suggests at once courtly dance and everyday walking. The motif of leading (for Cesena as well as En Atendant) has been established, largely embodied in a bearded male dancer whose style is distinctively casual. En Atendant oscillates between sudden groupings, scatterings and brief, exquisite duos and solos—sometimes realised amidst the crowd in a dynamic theatre of simultaneity enhanced by the dancers’ apparently intuitive capacity to find or avoid each other in moments of great fluidity (De Keersmaeker describes her strategies for this in my report of her post-show talk). As a group the dancers reach out, half-raising their arms, not quite suppliant but nonetheless as if collectively wishing for resolution, blessing, grace in a world of waiting, as expressed in the words of En Atendant: “While waiting, I must suffer grievous pain/ and languishing live, such is my fate/ for I cannot reach the fountain/ so many are the rivers that surround it.” Here there is “the hope for a goodly life” but “the true way cannot be found/ so troubled and sullied is the water.” In movements that range from simple to complex and demanding, both individual and collective, the dancing expresses meditative, sustained angular balances and passionate attempts to break through the barriers to purity. A male lead-and-follow duet intensifies with the men tensely resting heads and necks against each other as if wrestling with their frustration. One of them performs an enthralling, extended dance of apparently angry release, kicking at the line of earth as if it epitomises the obstruction “to the true way.” Individuals spin backwards or convulse on the floor. One man dances jauntily until he crosses the line, stops and stares at us. Bodies sink to the floor or fall back, then leap up with surprising ease. The line of earth is increasingly transgressed. The dancers fall as one, piled as a mass; they rest and then slowly rise to form a momentary tableau, suspended between inertia and quest before surging into individual trajectories, only to merge again, to fall and rise. Again as a mass, they slowly form into a vast rotating circle which spirals inwards. Among the final moments, a male performer dances naked, moving in large circles, at times fluently, at others jerkily, amplifying the sense of individual vulnerability and pain at the core of collective anxiety. For all its passion En Atendant is a highly formal work, framed by the complexly ordered expressions of belief in the beautiful Mediaeval music of ensemble Cour et Coeur, designer Michel Francois’ simple line of earth across the stage and the diminishing light from the stark bars hovering above, the stillness between passages of movement and music, the role of breathing (often to the point of near exhaustion) and de Keersmaeker’s insistent dance motifs that offer coherence and meaning, realised formally and informally and enhanced by the great attentiveness and responsiveness of the dancers to each other. The sheer otherness of the world that is realised by design, structure and juxtaposition is made all the more transcendent by the idiosyncratic choreography, not least in its unexpectedness—a language strange and wonderful. We waited with En Atendant’s performers in their epic struggle for a moment of grace and drank with them at its fountain. Or entered fearfully into the dark. In near dark a naked man stands immediately before us. Echoing the strenuous opening instrumental movement of En Atendant his breathing gradually vocalises into a repeated long cry that becomes an animal growl alternating with whistling, wrenching his body up and down from the waist. He breaks from this act of endurance into walking and then running fast in large circles and then wildly and randomly. 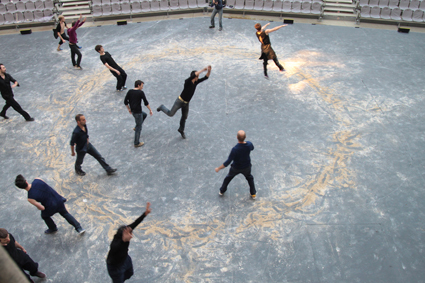 The rest of the performers appear from out of the utter upstage darkness, moving into the large chalky circle that dominates the floor, scuffing and skidding across it and then drawing back like a wave, in and out of the dark, like an emergent organism. Subsequently singers and dancers draw apart into their own realms, singing to the dancing, dancing to the singing, then merging in a kind of march, and scattering as a dancer again goes wild, flopping onto and breaking the circle. These eruptions are more recurrent and desperate than anything in En Atendant. The lead dancer stops, looks up, and down, reminding us of the seeking in that work, and of Cesena’s opening and the work of breathing. Two more dancers repeat the pattern. As more light is discerned individual and group flights of movement ensue, interrupted by freezes and collapses, forward and backward pulsing, arms raised, bodies swaying and sudden kicks. Someone walks, then races across the floor. A woman writhes. Another replaces her. The bearded man dances on the line of the circle, lowering himself into it. Singers and dancers manipulate each other’s bodies, dancers conduct the singing, multiple pietas are formed. As in En Atendant there are sudden massings—bodies pulled together, slumping as one and then appearing to be dragged en masse by an invisible force accompanied by loud bangs and crashes. Both works suggest a degree of involuntarism in such moments—the mass reveries and hysterias of the Middle Ages perhaps, or a drive beyond individual will towards the light. In other large groupings all the men come together to sing or the performers link hand to shoulder in fast/turn/slow lines involving leaning in, then back and skipping. Communal behaviour becomes more complex with the circle, regardless of its bruising, providing a centrifugal force. With the centrality of the circle established and the light brightening, a man and woman, then two men and then others dance vigorously if lyrically at its centre. Large doors at the back of stage slide open, light floods in and the performers circle and weave. What has the circle been but a human representation of the Sun, awaited, celebrated, enacted, sung and gloriously welcomed. As in En Atendant, the weave of individual, groups and sounds in Cesena offers a fascinating reverie if, on the one hand, less coherent and more opaque (another viewing would help gauge the significance of a number of solo and small group moments) but, on the other, thematically and aesthetically richer in its merging of dancers and musicians. 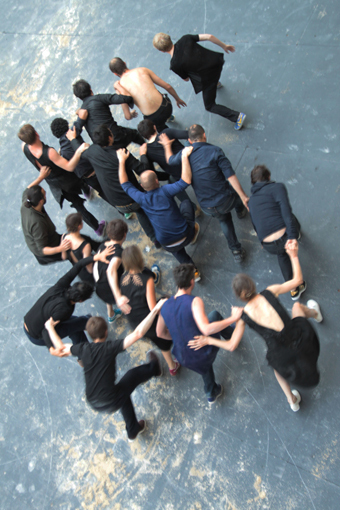 De Keersmaeker also pointed out that her collaborator Bjorn Schmelzer, director of the grandelevoix choral group, had chosen the pieces of music but without any thematic rigidity. Opposing the “holy boxing and sterilising” of music from the past, she said “our bodies are more contemporary than anything else. We visit this old music with our bodies and the grain of the voice gives it a completeness.” De Keersmaeker made the point that Schmelzer did not aim for polished performances, nor did she. “My approach to movement is architectural.” She saw herself as realising a “materialised energy…a natural and complex richness” rooted in informal movement. So it is that the companies of dancers and singers merge into one, sometimes significantly blurring their roles and amplifying the sense of community. 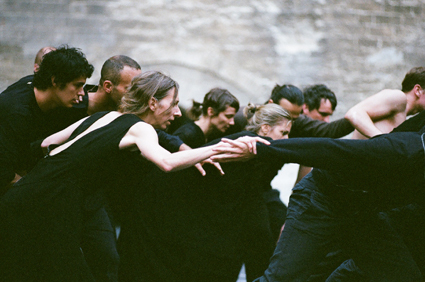 A few dancers, said de Keersmaeker, could not sing, but in the case of a Serbian dancer, the music connected with his cultural background. Matej Kejzar performed a fragment of a Serbian epic poem dealing with loss, an angrily delivered lament, sung with raw passion. On the other side of the stage the rest of the company gathered in a circle, accompanying him contrapuntally with melancholy serenity. For de Keersmaeker, the song recalls the grieving over the three-day massacre of the citizens of Cesena in northern Italy ordered by the Pope during the schism within the empire, and more recently the Serbian-Bosnian war. Another motivation for the creation of Cesena’s sole focus on the body, said de Keersmaeker, was a response to “the technicalised world post-WWII,” not least the dominance by speed that came with it and the technologies that negate the body. De Keersmaeker’s En Atendant and Cesena are now embedded deep in our bodies and psyches. She leaves us feeling we have danced the dance, and sung it, with Rosas, graindelavoix and Cour et Coeur. As de Keersmaeker says of music, “[It] frames my basic nature…[it provides] order in the highest degree of chaos,” so do En Atendant and Cesena offer metaphysical and existential succour as we struggle on and celebrate from day to day. Keith Gallasch's account of Anne Teresa de Keersmaeker's artist talk can be found at here.